Now that I've cleaned up behind the SSEi project, it's time to start the next one. I bought a 1997 LeSabre last winter as a replacement summer driver for my wife's '93 SE L67. The SE will become the dedicated winter car. When we first got the SE, it was if fair condition, only needing some interior repairs and some suspension replacement. However the concept of the car wash is very difficult to grasp and this car has started to rust out really bad. I just don't have the motivation to fix it if it's not going to be taken care of. The last time this car saw a car wash was the weekend of the first intense meet...not kidding. The best part of that is she was supposed to get a free carwash every week where she was working all winter long. It was literally attached to the same building. I'll have to work on getting more pictures, but overall it is in very good condition for it's age. Interior is clean, needs nothing, exterior has some minor dings in the plastics, and some paint chipping but nothing major is broken. Picked it up for scrap value because the motor spun a bearing and seized. Earlier this year I picked up an L67 and trans from a '00+ SSEi on half off day at the junkyard. And that's where everything has sat taking up space and just waiting... until tonight. I popped open the motor and selected a random main and rod bearing to see the general condition of the motor. Amazing! It's in perfect condition! No bearing wear at all. Pushrods don't have any galling at the rockers either. Which is great news. It means no time at the machine shop, straight into the build. P&P intake and exhaust, SC, and throttle body. Focus is on port matching. I'll be using the axles that used to be on the SSEi here, and possibly rebuilding the SSEi trans (well, fixing the input shaft at least) if the trans I pulled with the motor is shot. I still need to get a L67 engine harness for the '97-'99. I do plan on converting the A/C to R-152a if the system is not functional. The trans is going to get a 'reduced firm' shift kit. No more 1-2 chirp and broken input shafts. Shooting for a solid 14.5 second car. No body mods, only dent/paint repairs. But I do want to run 17" or 18" wheels (am taking suggestions) and HID retrofits. The main goal for this is to get it on the road again before fall, and maybe next year start on the retrofit, wheels, rear disc brakes, etc. Looks great Matt. Glad to see the motor is clean so you don't have to worry about that. Also, are you sure you don't just want a free 135k L36 for it so you can drop that L67 in mine? As far as wheels go, I've played with photoshop a lot over the years, and the only two combos I've found that look good are Grand Prix GTP 5 spokes like Gwegb has (or that style wheel), or my favorites are Mustang Bullitts. I looked into bent 5s, but with all the roundness that the LeSabre has compared to that vintage Bonne, they just looked weird. I had hoped they'd look great since J wikoff's car looks good with them, but without that aggressive front, they don't do a LeSabre justice imo. The A/C worked on that car last summer, so I'd imagine it should still be good. Also I was talking to Travis about this Buick just yesterday. They think the trans may have been rebuilt (that's what his uncle told him anyway) so it might be able to get used in something else. I would pull off ALL the caps. I have to pull the crank to chase the oil passages out anyway, there is some gunk in this motor from sitting in the junkyard without an oil cap, but I was just excited to see that there was zero wear on these. It means I've found a lower mileage engine. Well, if that trans really was rebuilt I think I'm going to swap out the HD differential and call it a day. That's actually great news as it might take this project down to a week or two to get done! Hmm... That money saved could go into a set of SD headers. I pulled the crank, all the bearings are just as clean as what I saw yesterday, and got the block cleaned up as best as I can without taking it to a machine shop. I did have to fight with a snapped head bolt, but a little Matt power fixed that up. This motor won't need any machine shop work! Removing a snapped head bolt. That's a big pipe wrench.. I do not own masking tape. Brake cleaner and rags will clean up the overspray faster than masking it anyway. 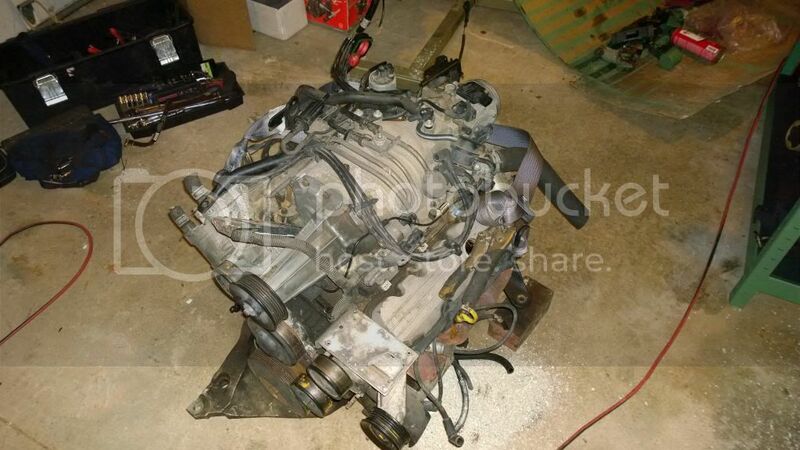 I expect to get most of the other parts (heads, intake manifold, etc.) cleaned up, ported, and pained up tomorrow. No new pictures yet. Still cleaning up a lot of parts. Heads, intake manifold, and timing cover are in primer. I think you can go faster than 14.5 given the NIC no? In any case, this will be even more of a sleeper than the Bonne. Trans should hold. I really really like that blue! I love this. Especially given the condition of the car. Can't wait to see it. A cat got in the garage, knocked stuff over and made a general mess of my work area, and now I get to re-paint the block. I am curious, why the R-152a conversion. The vibe of the thread listed above suggests it runs better in R-12 systems than R-134a does, but that isn't a factor here. R-152a pressure vs. temperature curve. For a given size condenser the R-152A will be more efficient than the 134, meaning cooler A/C temps, as one would note the '92-99 condenser size is insufficient for R134 anyway. The other benefit is cost, $10 to refill and empty system vs. the $40 for R134a. Edit: Just waiting on gaskets now. Everything is cleaned and repainted. some more pictures of the Lesabre when you get to them would be awesome. Can't believe you found a clean one. 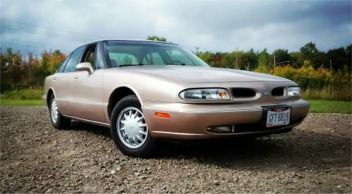 1999 Oldsmobile 88 Base....it has power windows and locks! Second rescue, might flip...Click HERE for project thread. 1998 Oldsmobile 88 LS w/ FE1 Float Suspension, Leather and Power Everything - Totaled (Rolled!) out during Winter of 2015 by Sister Click HERE for project thread. Parts are coming in today, most of them anyway. I ordered a few things from ZZP and a few things from Intense. Last week. And they hadn't shipped anything on Monday. So I emailed them, wanted to know what's up. Intense responded that they haven't shipped yet because they were waiting on some parts to get re-stocked, and that would happen in the next few days and they'd get everything shipped out as soon as possible. ZZP informed me that their automated mailing system would notify me when my parts shipped..